Hikari Sinking Carnivore Pellets provides a balanced level of nutrients, vitamins and minerals which offers superior over nutrition when compared to feeding live food. It contains high grade carotenoids to help fish develop vivid, natural colouring, and is suitable for most carnivorous fish without the worry of passing bacteria or parasites which can be given with live feed. Most carnivorous fish especially non-surface feeders such as catfish, sharks, polypterus (bichirs), eels and stingrays. Feed two to three times daily the amount your fish will completely consume in a few minutes. Care should be taken to avoid over-feeding. Carnivorous fish may resist a new type of food when changing their diet, but continued use will assure acceptance. 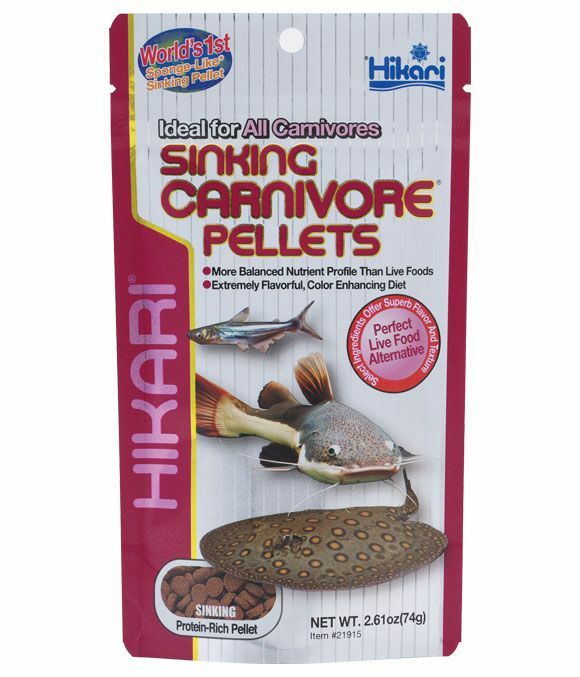 There are currently no questions for Hikari Sinking Carnivore Pellets Fish Food - be the first to ask one!